Booting up Tallowmere ($0.99) by Chris McFarland for the first time results in two things: eye strain and frustration. At least at first. The charm of this game takes some time to creep up on you, but when it clicks, it really clicks. There are some issues to be worked out, for sure, but there’s a reason our forums were getting really excited in discovering this game together. Tallowmere is a roguelike, and also a princess hanging out within said roguelike. As can be expected from the genre, it’s pretty difficult, and definitely takes some getting used to. The interface and controls are easily the weakest aspects of this bloody ride, so I might as well get them out of the way first. This game was designed for PC, and can currently be found on Steam. It is supremely obvious when you open up the options menu, only to find tiny text and closely packed buttons. The text remains eye-straining small throughout. Thankfully the developer, Chris, has stated that he’s working on a fix for this. The controls include small buttons, a touch anywhere D-pad on the left half of the screen, and everything else sectioned off on the right. It’s pretty easy to hit the wrong buttons, especially when things get frantic. So what’s good about Tallowmere? Well… Pretty much everything else! 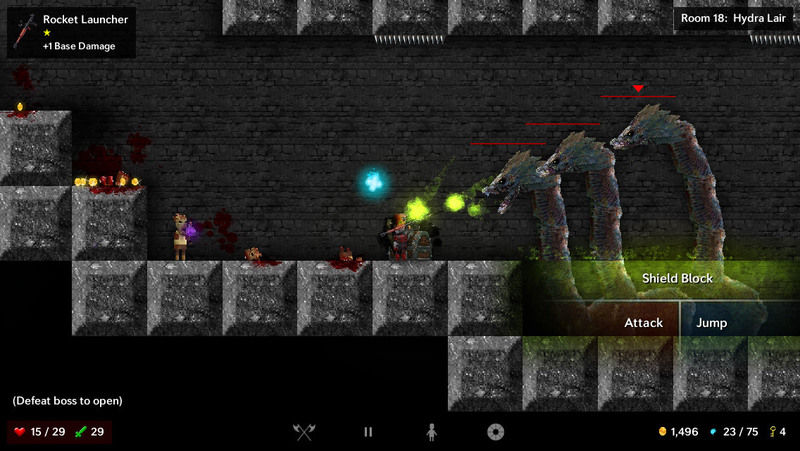 You’ll navigate a blocky 2D procedurally generated dungeon, fighting demons and snagging loot. There are some mechanics that really throw you off at first. For instance, you have infinite jump, and can basically fly. The gameplay has been compared to Dark Souls, and for good reason. Not only do you raise stats using the souls of your fallen enemies, trying to brute force your way through this game will surely end badly. Luckily you have a shield, and you really need it. Enemies will throw fire, lightning, and even homing stun attacks at you the moment you waltz into view. You have to move forward cautiously, and wait for openings to strike. Raising your shield makes you heavier, affecting your jump and slowing your movement. Why does this matter? Well, you’ll also deal with spike strips all over the place, floating spinning saws, and noxious gasses farted at you by evil skulls in the walls. This all adds a nuance to combat that feels really satisfying. You know what’s even more satisfying, though? The weapons. Oh man the weapons. Whether you’re ferociously swinging axes and clubs, shanking with daggers, shooting wands, throwing fire, chucking grenades, and launching rockets, killing stuff is F.U.N. fun in this game. You can attack as fast as you can mash the button, and there are no limits on ammo. 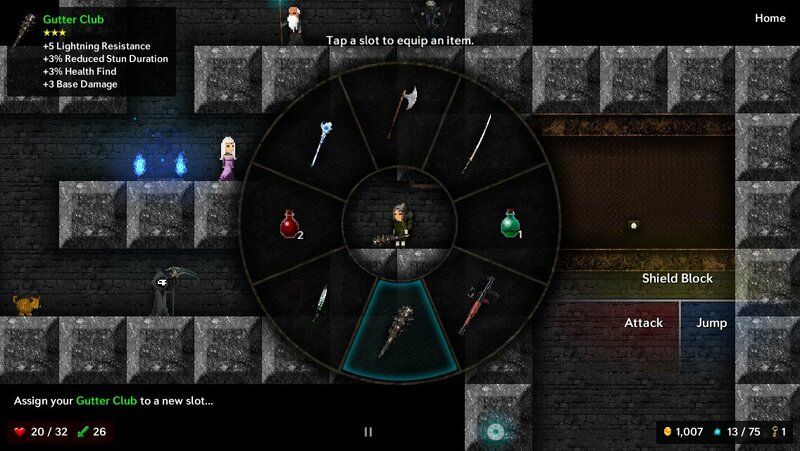 Why are there grenades and rocket launchers in a fantasy dungeon crawling roguelike? As the trailer outright states, why not? That “Why not?" attitude of the game’s design is probably its biggest boon. Throughout the world you’ll find chests, merchants, demon statue upgrade stations, and fiery blue waypoints. These waypoints bring you back to the starting room, where you can be infinitely healed by the fair lady Tallowmere herself. Yes, this game still manages to be difficult, even with rocket launchers, health potions, and frequent opportunities to heal. This starting room is where you’ll find yourself immediately upon loading the app; full of NPCs explaining the mechanics to you. It’s here that you can always find a shop, a demon statue, and Death himself, along with a basket of kittens. Capital ‘D’ Death lets you add restrictions, called ‘punishments’ to your run. Things like no health regen, no merchants, no coins from enemies, and even no heals from Lady Tallowmere. You can also make the game easier for yourself, upping your starting HP by up to 90 points. How? Brutally slaughtering any number of the 9 kittens in that basket. Yikes. This is a classic roguelike in that you retain nothing from run to run. It’s all about getting on one of the various high score boards, determined by how many kittens you sacrifice, naturally. At a glance, Tallowmere isn’t much to look at. It’s crisp and clean, but plain looking. Until you start fighting your first enemies. Then you’ll see the vivid colorful spells and particle effects, which contrast brilliantly with the cold gray of the dungeon. And the blood and body parts. Man, oh man. Everything you kill explodes into bits, leaving limbs and a rolling head which can still be launched all over the place via explosions. If your device starts stuttering, you can lower the level of gore and effects. My iPhone5S handled the game perfectly cranked up to max. Tallowmere is full of neat little touches. It definitely isn’t for everyone, but almost everyone seems to come to like it after a while. You’ll hear the same story again and again. People try the game, stop in annoyed frustration, before picking it up again within an hour or so and getting hooked. Like I said, it has a certain charm. I wish Chris McFarland would have designed an entirely new interface for mobile, as much work as that would be. But implementing some simple fixes and increasing the font size will make this game much better than it is. This is a deceptively engaging ride with plenty of unexpected, organic moments to remember fondly, despite the rough edges. Definitely worth a look. Screw Flanders.